Run a practice, or want to someday? Discover the critical marketing mistake 93.6% of hypnotherapists make which annihilates their chance of getting clients. Skip this one and watch dollars go down the drain. Learn the mindset that automatically makes your marketing ‘mucho mas efectivo’. Uncover the skills to instantly grab the attention of the clients you want, the moment they see your marketing materials. You have, on average, 3.4 seconds to get your message across to your potential clients. Do you know what to say to pull them in? 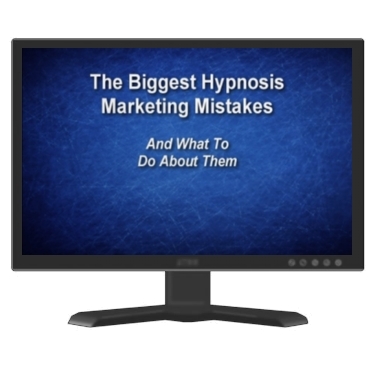 Discover it in The Biggest Hypnosis Marketing Mistakes & What To Do About Them.